Loughborough has been named the best sporting university in the world in the global QS higher education league table. It is actually the first time the annual QS World University Rankings by subject have included a list of the world’s best places to study sports-related subjects and Loughborough ranked joint-first with the University of Sydney, Australia. This is a fantastic testament but fully justified by all the hard work done by both staff and graduates over the last 60 years. The ethos of the university brings together exceptional athletes, facilities, coaching and research expertise with extensive partnerships with major sporting organisations, such as Sport England, RFU, ECB to name a few. Loughborough won the title in recognition of its unparalleled role in the triumph of the British Olympic and Paralympic teams at Rio 2016. Over 80 students, graduates and Loughborough-linked athletes travelled to Rio to participate in both the Olympic and Paralympic Games. In the Olympic competition they secured 12 medals, including five golds, and if Loughborough University was a country they would have finished 17th on the medal table. Similarly during the Paralympic competition Loughborough-linked athletes secured a further 22 medals, signifying that Loughborough would have finished 10th in the Paralympics medal table if they were a nation. With a total of plus 15,000 students on campus, coupled with around 400 performance student athletes, the university is a busy place to be during term times. A total of 71% of students at Loughborough University regularly participate in sport at least once a week – Sport England Higher Education Sport Participation and satisfaction Survey for 2015/16. From alumni to collaborative partners, and organisations that use campus as their HQ, Loughborough University is associated with a number of household names. Some of the most celebrated names in sport have studied at Loughborough including Sebastian Coe, Paula Radcliffe, Dame Tanni Grey-Thompson and Sir Clive Woodward. Loughborough University is home to the country’s largest concentration of world-class facilities across a wide range of sports, they include an indoor athletics centre and outdoor stadium, sports halls and all-weather pitches, a 50-metre swimming pool, squash, badminton and netball courts, an indoor tennis centre and outdoor courts, and state of the art fitness centres. The grounds and gardens are maintained by the university’s own in-house grounds maintenance team consisting of 12 full time groundsmen and 20 full time gardeners of which two are fully trained arborists. These teams are supervised by Managers William Relf (25 years’ service) who oversees all the sports facilities while Karen Setchell (32 years’ service) manages the gardening teams. Will and Karen took over the running of the department in 2016 when the previous Estates Manager Mark Freeman retired. 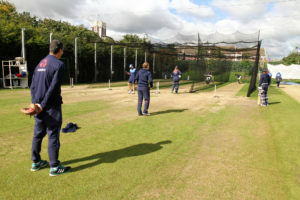 The sports grounds team are split into three teams of four, one solely looking after all the Cricket facilities on campus, whereas the other two teams are split by geographical areas and cover a multitude of sports facilities. The gardening team consists of five working teams, each with their own areas to manage and maintain. The Arborist team (one man and one woman) maintains all mature trees, two heritage woodlands and plantations on the site. As for natural grass pitches the university provides thirteen senior natural grass pitches – six football, four rugby, one American football and one lacrosse. 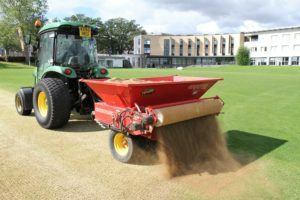 The pitches are renovated and topdressed every year using compatible sand dressings, applying between 60 and 100 tonnes per pitch. Loughborough is also the home of the ECB National Cricket Academy and boasts some of the best cricket practice and playing facilities in the world. The facilities include: Two natural grass cricket squares and outfields, sixteen outdoor cricket natural grass net areas (on Ongar clay), eleven artificial wickets (five outdoor and six indoor) Complete full size indoor net areas with full bowlers run up and wicket keeper area. The university also provides some of the finest indoor and outdoor athletics facilities in the country. This includes the indoor High Performance Athletics Centre (HIPAC) enabling athletes to train and perform in the best environment available. A new dedicated Athletics throwing arena is currently under construction and will be ready in the new year. Tennis is exceptionally well catered for with 17 artificial courts of which, three are overhead irrigated American Fast Dry outdoor clay courts. Three outdoor acrylic courts, Four indoor acrylic courts, four Plexipave indoor acrylic courts, plus two tarmac courts. 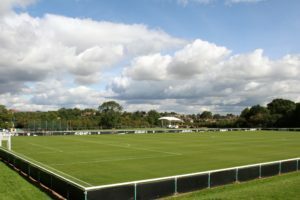 The university also has several full size artificial pitches on campus, all having different playing characteristics and maintenance requirements. In the past many artificial surfaces were sold on the back of maintenance free advertising. This is just not the case at Loughborough. Will and his team spends nearly as much time on their artificial surfaces as they do on natural surfaces. The university has spent a lot of money investing in specialist brushing and vacuum machinery to keep these surfaces clean. As for the tennis courts these are brushed daily while the American fast dry courts are again brushed daily, the frequency being dependent on use. This will usually be twice a day when busy. Generally, they are dragmatted with a rubber dragmat across the line of play, followed by another with a brush in the line of play. They are then watered, using the pop up automatic irrigation system, to damp down the clay ready for play. It usually takes about an hour and half for one man to complete all the daily work on the three clay courts. The courts also require topdressing twice a year, regular supplementary dressings throughout the season to maintain levels and a regular rolling programme. A recent visit enabled me to meet up with Will and walk around the campus to see some of the latest industry developments going on. Will was keen to show me the new reinforced cricket pitch trials, where a number of his existing Onga and Boughton loam pitches and net areas have been sown with some artificial fibres simulating a SIS Grass/Desso style hybrid pitch system. The results have been amazing with a dramatic reduction in wear and foothole damage, while ball bounce and turn has not been adversely affected. Two colours of yarn have been tried, a green one and a brown one to see which one is ascetically pleasing to coaches and players. It will be interesting to see how these pitches respond and recover from their end of season renovations. Will also said, that many of the players had not even noticed these fibres. We then went on to see another ECB backed trial, that began last June, which saw three drop-in pitches installed into the universities cricket square. Each pitch is contained in three steel trays, the object of the project is to be able to transport and use the pitch in a large capacity stadium, thus having the ability to play a cricket match at a different venue. Early signs are good, the 200mm deep trays are performing well. It is now a case of progressing to the next stage. Transporting and installing the pitches at a national stadium, and then play an international match on them? Will was then keen for me to see the new throwing arena being built, that will house an outdoor covered throwing facility to accommodate javelin, discus and hammer athletes. This purpose built training centre will enable athletes to train all year round. Just driving around the campus, made me realise how big and busy this place is, wherever you looked, there was a different sport activity going on. One of the busiest times for Will and his staff is during late spring, when they have to change over from a winter sporting calendar into the summer feast of sports. This work also includes having to undertake spring renovations on some of the pitches. 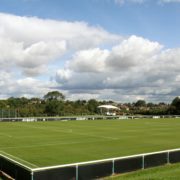 Renovations are carried out on a rotational/need basis, and generally involves a programme of work that involves scarifying, aeration, topdressing and overseeding with some pitches getting a few weeks rest and recuperation. Having a large fleet of machinery helps enormously, the ability to get around the campus quickly is paramount, all the teams are given a John Deere Gator to help transport themselves, machinery, tools and materials. Will also has a modern cutting fleet of ride on mowers to help cut the grass efficiently. A laser guided Kombi line marking system also saves time when marking pitches on a weekly basis. The university have also invested in their own sprayers and aeration equipment to ensure they are able to carry out this work promptly and when they choose too, instead of waiting on contractor time frames. As ever, Loughborough is definitely up there with the best Universities when it comes to managing and maintaining its estate, however, with so many top sports performers based at Loughborough expectations will always be high and the main driver for the grounds team to deliver top class sport facilities.